James Franco and Tyrese Gibson in Annapolis. So how familiar does this story sound? A young guy from the wrong side of the tracks wants to be a U. S. naval officer. 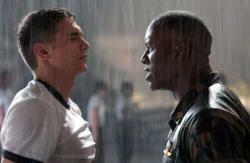 He has to deal with a tough African American Company Commander. Near the end of the movie they fight each other in a boxing ring. He falls in love with a local girl. His best friend attempts suicide. No, I am not writing about An Officer and a Gentleman, I am writing about Annapolis, unfortunately. How can former Family Guy writer David Collard, take writing credit for this movie? His big plot differential is that the local girl ends up being a fellow sailor and not a factory worker looking for a husband. I suppose since this movie is so bad that the makers of An Officer and a Gentleman really did not care. 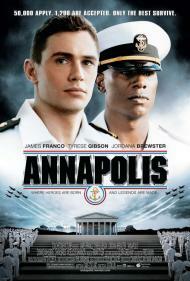 Annapolis would have been better off as a spoof of An Officer and a Gentlemen. There is plenty of room for satire there. Instead, this is just a very weak remake with an awful cast. Gibson is to stiff and has none of the humanity of Lou Gossett Jr. Brewster is completely unconvincing as a naval officer. She is far to attractive and fragile looking to pull off the role, and what the hell is a twenty something hottie doing hanging out alone at a bar populated by middle aged blue collar ship builders? James Franco, for the sake of being remembered for anything more than Peter Parker's best friend, needs to choose better scripts. Whatever his method has been for choosing scripts up til now is not working. When he read this script, did it not sound even a bit familiar? Spiderman 3 aside, it will be a long time before I watch another movie starring James Franco!